National Park Service Barbara Otterson had to decide what to do with her husband, James Gooderum’s, cremated remains. A Vietnam War veteran, suffering from Post-Traumatic Stress Disorder, she took him to the only place she knew he would find peace; the Vietnam Veterans Memorial, “The Wall,” in Washington, DC. “The Wall” was dedicated in 1982. 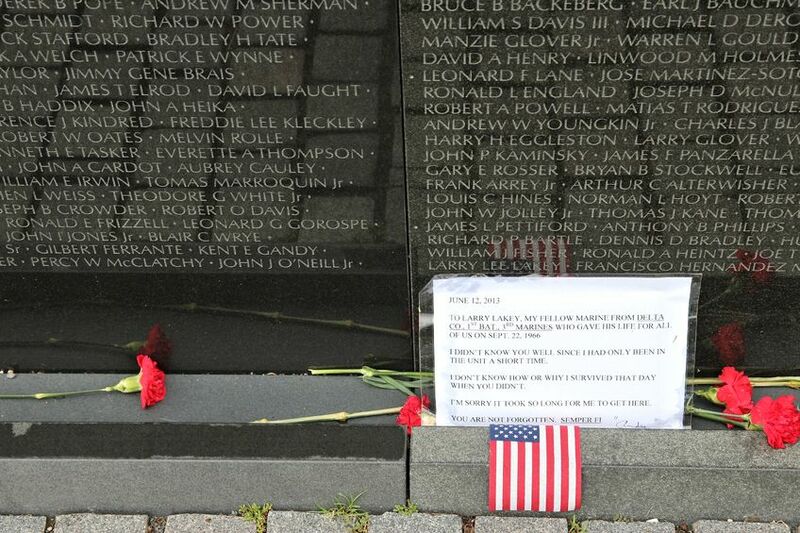 58,318 names of those lost in the Vietnam War are engraved into the sloping black granite wall. It has 140 shiny panels, visitors can see themselves in the reflection, uniting the living with the fallen. Hundreds of thousands of memorial items have been left by family, friends, fellow veterans and total strangers. The Army News service reported the first item left was a Purple Heart that was thrown into the foundation of the memorial when the concrete was poured. The items have kept coming ever since. “There are Teddy Bears, belt buckles, photographs and letters, cowboy and jungle boots, flip-flops, silk roses, a Memorial and artificial Christmas tree, rag doll made from socks, dog tags by the hundreds, service ribbons, captured North Vietnamese flags, inscribed baseballs, a tree made from lollipops, and a customized Harley-Davidson chopper with the etched names of 37 Wisconsin service members who never returned from that war all on display, symbols of pain and healing to those left behind to mourn. We have a pair of cowboy boots that are similar to the type worn by many of the pilots during the war. We have a pair of black pantyhose – something many veteran nurses told me was not unusual for them to wear under their jungle fatigues so they could remind themselves they were still women in the midst of all the madness,” then Secretary of the Interior Dirk Kempthorne reported in 2007. Leon Castro, a Vietnam veteran himself, made the decision to place his brother Gordon J. Castro’s urn at the Vietnam Memorial. He told the Washington Post that his brother Gordon “left the better part of himself in Vietnam.” He placed his stainless-steel urn, with his purple heart, his silver and blue Combat Infantryman Badge and a 1st Calvary Division insignia affixed to it in his Ford pickup and drove him from Corpus Christi, Texas to Washington. He had last minute mixed feelings about leaving his brother but left him at the Memorial in the end. Signs were posted stating that human remains, and associated objects should be not be left or scattered anywhere on the Washington Mall. We must understand why people would choose this mode of disposition. These veterans are entitled to a proper inurnment at a national cemetery, if they were honorably discharged. They know that these urns, containers and envelopes will not be allowed to stay where they lay them. The objects left at “the Wall” are kept in the Museum Resource Center in suburban Maryland. The cremated remains are kept in a separate metal cabinet. There are about 80 containers of cremated remains. Some in containers, some scattered. The first one appeared in 1990. Thirty-one appeared in 2017. The 50th anniversary has increased the number of urns and containers left behind.